Using VRCR technology is easy. Just start with the basics. straight to that mode of using VRCR, stress reduction technology. When using VRCR in this mode of operation, the main tool or attachment is the Violet Ray Bulb. With the Violet Ray Crystal Resonator (VRCR) set to the Heart Chakra (Love Center), you will be receiving the highest concentration of the Violet Ray Energy. In this mode, Violet Ray Energy takes on the component of Violet Light inside the bulb. The Violet Ray, along with the Golden, Elemental and Double Violet Ray, are riding a carrier Pulsed DC Carrier Frequency of 250.56Hz. This is the frequency of the electromagnetic field pulse for the Heart Chakra. Note – the Violet Ray, Golden Ray and Elemental Rays are present with every setting and attachment of the VRCR. Each ray has its own setting where its manifestation is optimsed. However, the VIOLET RAY BULB is the only attachment that also manifests the visible LIGHT portion of the energy. And, the arcing action adds an additional PEMF action to the VR Bulb Treatment. You may hold the Bulb over you Heart Chakra for accurate tuning of that center. You can also treat each Chakra with the Violet Ray Energy of the Bulb and it will assist that center to move into its proper frequency. This is because the Violet Ray Bulb setting is a direct octave harmonic of each Chakra frequency. However, for a full 16 Chakra Balancing and Tuning, you would want to use the VRCR in the Single Wand Mode where you could precisely tune each Chakra. Body workers; feel free to experiment with using the VRCR to assist you with your healing modalities. If you work with meridians, acupressure, acupuncture, polarities, etc., try using the Bulb and Wand on these points of interests. Another way to use the Bulb is to hold it against your Jugular and Carotid Artery in the neck for a few minutes to irradiate the blood with the objective of destroying bacteria & viruses. Note: This is information that was given to Jack Derby by his “Teachers” and has not been scientifically proven though plenty of anecdotal evidence has been collected. You may place the Violet Ray Bulb anywhere on the body that you may have pain, discomfort or a condition in need of attention. You will have to be the judge on its effectiveness but it is believed that the Violet Ray Energy, Electro Magnetic Energy and other multifaceted energies being emanated in and around the Bulb assist the body in healing, balancing and tuning energies. * The level or amplitude of the Violet Ray Energies are completely Bio-compatible and are of no risk to the extreme majority of users. However, our Radionics Machines should not be used by or on people with pace makers or other bio implanted electrical devices or by pregnant women. You will be adjusting the VRCR to 16 different settings or frequencies as you move through the complete Balancing and Tuning of the Chakra System. Each of the Chakras has it’s own corresponding frequency that must be pulled into alignment. With the VRCR off, plug a Wand of your choice into the High Volts Output socket. Chakra Balancing and Tuning is a very PERSONAL procedure and will vary from individual to individual. The following is a mere skeletal procedure, which can be enhanced with whatever feels appropriate to you. Not everyone may desire a spiritual approach to Chakra Balancing. If so, just let them know that their bio-fields are being balanced and charged so as to relieve cellular stress. It is also re-tuning and reconnecting their clock cells to Earth’s Schumann Resonance EM field. Schumann Resonance is vital to their health. Have the person lie comfortably on the floor or on a healing bed. Dim the lights, burn some incense, light a few candles and play some soothing music if okay with the person you are working on. Set up the VRCR close to the person’s waist. The cords are approximately 6′ long to reach head to toe. Take a few moments to center yourself and declare that you are an instrument in Service of the Light. Ask for guidance and be totally open to do and say what might be given to you. You will hold the Wand touching each Chakra a minimum of 30 seconds unless noted otherwise. SAY: Please take a few deep breaths and totally relax your body as we begin. SAY: Focus your attention to where you feel the wand. If there is any tension, pain or stress in this area, gently release it into the Light for transmutation. When this area feels comfortable and relaxed, picture Source Love, which is pure cosmic energy, entering and filling this area; vibrating and tuning this CROWN CHAKRA to resonate in harmony with your other Chakra Centers and Mother Earth. Picture this Chakra and the surrounding area fully tuned, balanced and overflowing with energy. Then, with each following Chakra, you may say something similar as stated here or use your own intuition to best fit the needs of the moment. 2. Set the VRCR to the IMAGINATION CHAKRA, then place Crystal Wand 3″ BEHIND CROWN. 3. Set the VRCR to the WILL CHAKRA and place Crystal Wand 3″ IN FRONT OF CROWN CENTER. 4. Set the VRCR to the UNDERSTANDING CHAKRA and place Crystal Wand on THIRD EYE. 5. Set the VRCR to the FAITH CHAKRA and place Crystal Wand BETWEEN EYES. 6. Set the VRCR to the ZEAL CHAKRA and place Crystal Wand on UPPER LIP. 7. Set the VRCR to the POWER CHAKRA and place Crystal Wand on THROAT. 8. Set the VRCR to the HEART/LOVE CHAKRA and place Crystal Wand on HEART. WE RECOMMEND HOLDING THE CRYSTAL WAND VERTICALLY OVER THE HEART CHAKRA !! if you feel called to do so. Use your intuition. You may notice a difference. 9. Set the VRCR to the WISDOM CHAKRA and place Crystal Wand on SOLAR PLEXUS. 10. Set the VRCR to the ORDER CHAKRA and place Crystal Wand on NAVEL. 11. Set the VRCR to the STRENGTH CHAKRA and place Crystal Wand on 2″ BELOW NAVEL. 12. Set the VRCR to the ELIMINATION CHAKRA and place Crystal Wand 4″ BELOW NAVEL. 13. Set the VRCR to the ROOT BASE CHAKRA and place Crystal Wand on GROIN AREA. 14. Set the VRCR to the EARTH CHAKRA and place Crystal Wand on 6″ BELOW FEET. 15. Set the VRCR to the HEAVEN CHAKRA and place Crystal Wand 12″ ABOVE CROWN. 16. Set the VRCR to the SOUL CHAKRA and place Crystal Wand 6″ ABOVE CROWN. Explain that – when the Powers of LOVE and WISDOM meet in the Solar Plexus (Wisdom Chakra), they create an aspect of consciousness, which is called HUMBLENESS. This opens the “door” to an INNER, UPPER ROOM; a place within us where GOD DWELLS. It’s tapping into what science calls our “quantum entangled” state of awareness. Suggest to the person – that they see and feel themselves floating up from where they are now until they are in front of a door. This is the door to the inner, upper room. Have them enter and see the special healing and meditation bed in this room. Any prayer made from “this sacred place,” GOD, SPIRIT, THE ONE, ALL THAT IS, will hear and answer you. Have them lie down on the bed, on their back, looking at the white ceiling consisting of White God Light shining on them; filling and saturating to overflowing, every cell in their body. From this place, they can have any experience they desire (i.e. tuning into their life purpose, their soul energy, meeting their guides, Masters, Jesus, etc.) Suggest that they use this as a place to go within where they can connect with the CENTER OF THEIR BEING from now on. With the VRCR controls still set on the SOUL CHAKRA, slowly move the wand in a sweeping motion about 6″ above the body over ALL Centers. Starting from the top, sweep down to the EARTH CHAKRA and back up to the SOUL CHAKRA and then exit via the HEAVEN CHAKRA. Suggest to the person – that they remain quiet for a few minutes with their eyes closed before they leave. This completes the 16 CHAKRA BALANCING and TUNING procedure. Switch off the VRCR or connect it to the antenna and set it on the Crown Chakra or Understanding Chakra setting and let it do its job as it treats the room in the background! Another option for this Balancing/Tuning mode is to attach the Pyramid Antenna to the Low Volts Output during the balancing and tuning procedure. The Pyramid Antenna is acting primarily as a receiver in this configuration. Only Christ Consciousness or higher energies will be received and added to the balancing and tuning process. This is due to the filtering or cleansing nature of the Posikiation Process mentioned elsewhere. Your VRCR is YOUR personal tool. Take the time and look into the Crystal Array while it is working (while running of course) and enjoy the beauty of it. Become one with it and you will know intuitively which settings are the most appropriate for the task at hand. When using VRCR in the Double Wand Mode of operation, one Wand is plugged into the High Volts Output socket and the other is plugged into the Low Volts Output socket. You may set the VRCR to any of the 16 Frequencies in this mode. The High Volts Wand may be placed on any area of the body desirous of energetic entrainment. The Low Volts Wand, being the return path for the energetic circuit, may be placed against your skin anywhere else you like. 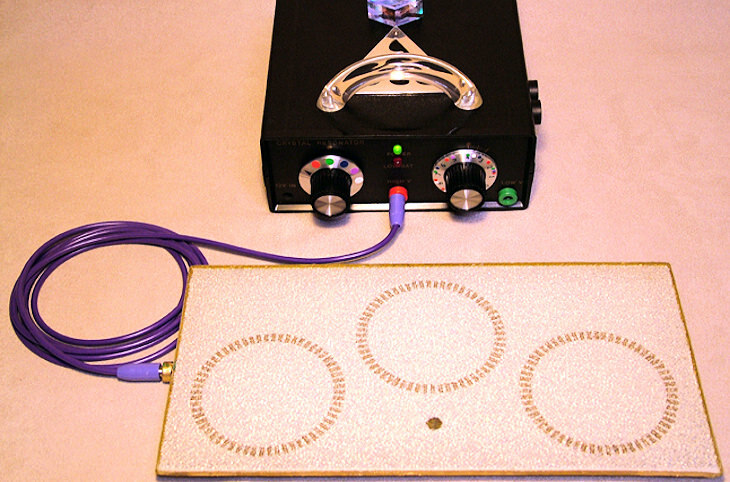 The DOUBLE WAND MODES – are useful for specialized assistance that make use of the 16 different Frequencies. They are used in a different way than with the Chakra Balancing or Chakra Tuning. In general, the Double Wand Mode places more focus on Balancing, Tuning and Health Maintenance procedures. But it can also promote healing of pre-existing conditions; as does the Violet Ray Bulb Mode. Certainly, you could follow up a Violet Ray Bulb Mode treatment with a Double Wand Mode. AMETHYST WAND – holds the energy of higher understanding and spiritual wisdom. It bolsters the Violet Ray energy and brings in the Double Fold Back Violet Ray. 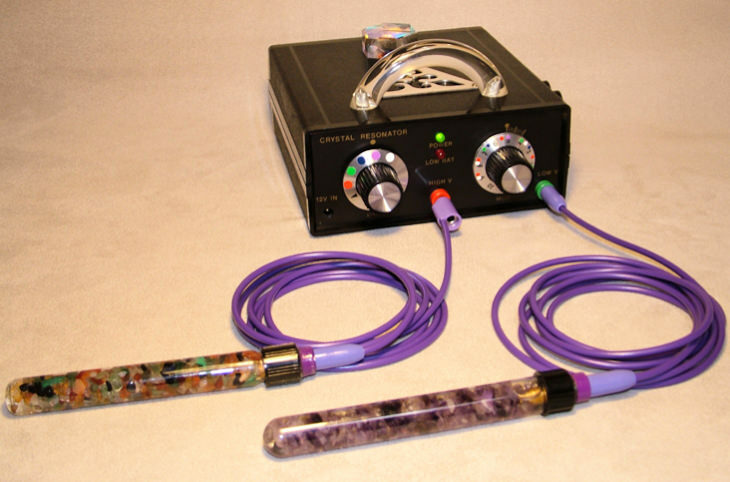 MIXED CRYSTAL WAND – is for “grounding” related to energy treatment for the physical body and thus would usually be better suited for plugging into the Low Volts Output in this mode. However, there are no set rules for where the wands should go. To give a higher focus to one or the other Wand qualities, place the desired Wand into the High Volts output of the VRCR and the other Wand into the Low Volts output. In general, set the VRCR for the Chakra closest to the area of the body you are treating. Lower legs would be the EARTH Chakra, upper legs the LIFE Chakra; abdomen could be the ORDER Chakra, etc. Refer to the charts in the VRCR manual for the various qualities and organs attributed to each Chakra. INCREASE SPIRITUAL AWARENESS – Set VRCR to the Understanding Chakra and place 1 wand on the center of forehead and the other directly behind it on the back of the head. BRAINWAVE FUNCTION ENTRAINMENT – Use a desired VRCR setting from the “Brainwaves Settings Chart” and place wands on the Mastoid bone behind ears, on temples, at the base of brain or at the Zeal Center. Also, use VRCR settings closest to the Chakra in treatment. DUAL WAND THROAT CHAKRA – Set VRCR to the “Power or Throat Chakra” and place HV Wand on throat. Now, place the LV Wand on the Spleen area and then switch to Liver area as described earlier. CLEANSE BLOOD of OPPORTUNISTIC ORGANISMS – Next, using the same positioning, you could switch the VRCR setting to the “Love/Heart Chakra” frequency. This setting provides the highest energy so use it to assist blood cleansing with the HV Wand over the Carotid Artery and Jugular Vein on both sides. Body Workers – Working with DUAL holding points? – experiment when using the VRCR to assist you with your healing modalities. If you work with meridians, acupressure, acupuncture, polarities, etc., try using the two Wands on DUAL points of interests and at various frequency settings that you believe relate to the energetic definitions for that modality. Of course consider the Chakra that is closest to the area of treatment when setting frequency. Even though the wands may be placed anywhere, we share with you special placement positions of the LOW VOLTS WAND. These positions encourage the body to perform its natural healing and maintenance functions, in conjunction with the area being energy entrained by the HIGH VOLTS WAND. LOW VOLTS WAND ON SPLEEN: The Spleen is a storage area for life force energy; some of which comes from solar energies during the day that supplies the body in the night. 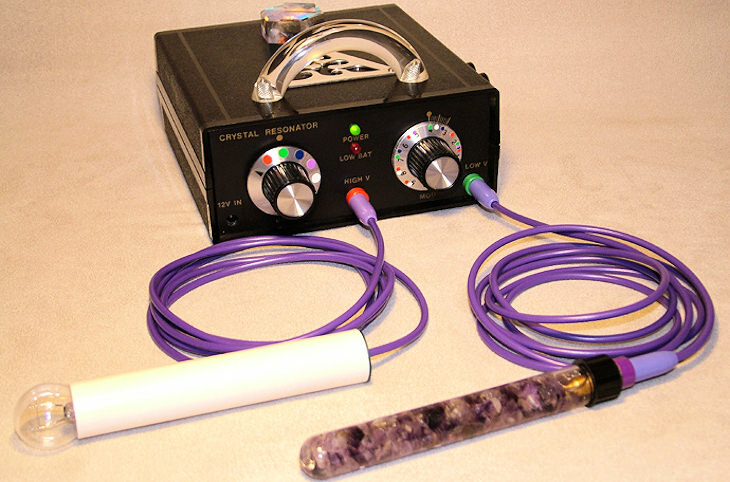 Start an energetic entrainment for any part of the body you choose, or one of the Chakras, with the High Volts Wand. Then place the Low Volts Wand on the Spleen. This will stimulate the Spleen to send energy to the entrainment area; both through physical, quantum and spiritual channels. This effectively places the Spleen within the energetic loop and adds its natural healing energy to the entrainment process. LOW VOLTS WAND ON LIVER: Liver function is one of cleansing and detoxification. Continue or start a new energetic entrainment for the body area of choice with the High Volts Wand. After using the Spleen positioning to start the energy entrainment, switch the Low Volts Wand to the Liver area. This will now stimulate the Liver to cleanse and detoxify the area of entrainment under the High Volts Wand. This effectively places the Liver within the energetic loop and adds its natural healing energy to the entrainment process. and the Pyramid Antenna into the Low Volts Output. When using VRCR in this mode, the function of the Pyramid antenna is primarily to RECEIVE all Universal or “Collective” energies except for one really important caveat. And that is, it can only receive Christ Consciousness and higher energies that will be allowed into the system through the filtering of the “Posikiation” process. This ensures reception or transmission of ONLY the highest intent for group energies and prayers directed toward a recipient. The Pyramid Antenna always transmits and receives no matter what output it is plugged into. This is also due to the Posikiation process. Only its focus or main purpose changes dependent upon configuration. When using the VRCR for Sleep Apnea treatment or to increase having and remembering creative dreaming, etc., one or two people can place a Wand under each pillow when sleeping and set the VRCR to any desired Frequency. Simply choose a Frequency of a Chakra that represents the qualities you would like to focus upon. Also, the lowest of the 16 VRCR settings has the effect of slowing the brain waves down for creative dreaming. Although not an official harmonic of the Schumann Frequency, setting the VRCR to Red-0 will produce an approximate 2 Hz. frequency that will take you into deep sleep. 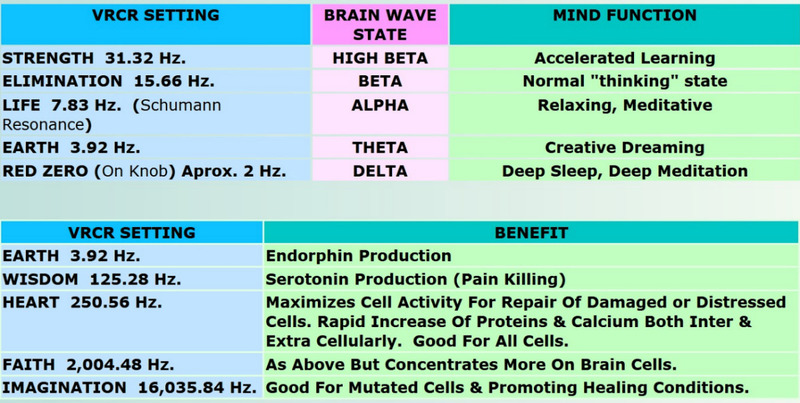 Select a frequency from the brain waves chart that is focused on the desired effect such as accelerated learning at the Strength Chakra setting of 31.22 Hz. Then, either hold the High Volts Wand with your hand or rig a way to hold hands free and place on the Zeal Chakra behind the Hypothalamus. Another option would be to use the Pyramid Antenna instead of the Wand and hang it behind the head or in close proximity for maximum affect. Then read and study away! Or set VRCR to the Life frequency of 7.83 Hz (Schumann Frequency) and allow it to assist your meditations. 2 people can use a Wand each for simultaneous Chakra Balancing and Tuning. In this mode, the Pyramid Antenna focus is one of Receiving Christ Consciousness, quantum awareness or higher from any source. So, whether you have a group of people projecting a healing energy all in one room or instead have them spread across the planet, the VRCR will add Christ conscious energy to its own energy and send this to a recipient through the High Volts Wands. The Antenna in the Low Volts Output will do the same thing when you are using the Violet Ray Bulb with the VRCR set to the Love Chakra. And don’t forget, the VRCR’s crystalline matrix is quantum entangled with the Earth’s natural Crystal Light Grid. How’s that for extra assistance? For optimum effect, find a way to place the Wand to the Zeal Chakra at the base of the brain (rest it on a pillow, top of a chair back or make yourself a necklace that will hold the Wand at your back. Be innovative. Using the Pyramid Antenna in place of the Wand in close proximity also works. Just having the Pyramid in the room works but having it closer is better. To start, set VRCR to LIFE CHAKRA – RED – 7.83 Hz – promoting Alpha State relaxation. After a minute or two, change the setting to the ELIMINATION CHAKRA – RED – 15.66 Hz – promoting Beta State for one minute. When done, switch back to the ELIMINATION CHAKRA – RED, for one minute. Switch to LIFE CHAKRA – RED, for at least three minutes. And that’s it! Place the Crystal Wand under your pillow at the base of the brain or Zeal Chakra. Set the VRCR to EARTH CHAKRA – RED – 3.92 Hz- promoting Theta State for creative dreaming. If still not asleep in ten minutes or less, set the VRCR to RED – 0 (zero) – approx. 2 Hz – promoting Delta State for deep sleep. Good night. 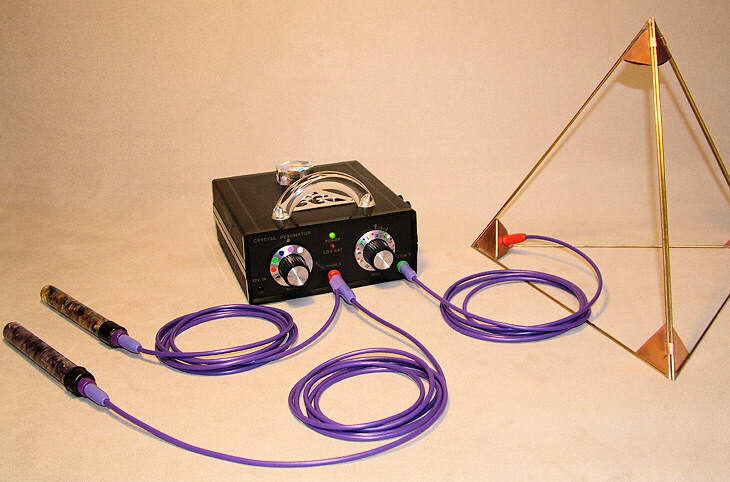 When using VRCR in the Transmit & Receive Mode: The Pyramid Antenna (with attached Wand) is the main tool or attachment. There’s no other Radionics device that taps into Quantum Information Fields as does the VRCR. That’s why its so powerful for making coherent and amplified healing prayers, intentions, co-creation work and Violet Flame Meditations. Watch this video to see how easy the 4 sided pyramind shapped Transmission Antenna is to setup. It is used in both Modes 4 and 5. Be careful and avoid touching the antenna when it is charged with the higher energy Heart Chakra frequency! vibrations are emitted at the Heart Chakra Frequency of 250.56 Hz. That’s because the VRCR’s AMT Coil is tuned for maximum output at the heart wave frequency; which is the 5th octave up from the Schumann nominal resonance frequency of 7.83 Hz or cps. 250.56 Hz is the electromagnetic pulse that best supports the bodies Chakra system. Its not necessarily directly evident as a physical or cellular level vibration rate. But rather, the resonant EM field frequency of the Heart Chakra itself. As with all chakras, they operate best when balanced and tuned to be in harmony with Schumann Resonance. Then, the chakras job is to regulate the bio-fields that support the cells at their physical vibration rates. So keep in mind, the Chakra EM fields vibration rates are not necessarily the same as cellular vibration rates. The biggest misunderstanding and disagreement that people have in regards to various vibration rate systems and modalities, comes about because people are not judging apple to apple in their comparisons. Vibrations take on many kinds of energetic manifestations. And EM or electromagnetic field vibrations may not directly relate to sound vibrations or light vibrations or magnetic variances, etc. So, if you’re an energy healer and are considering making use of a certain frequency system or modality, such as Solfeggio Frequencies, be sure to know the original use and intent of said frequencies. Were they intended as audio, physical or cellular vibration, EM pulse, light pulse? And consider not only the type of energy it relates to but in what medium is it being projected within. There is a lot of hype out there. And just to be clear, the Schumann Resonance based waves of the VRCR provide a FULL EM ENERGY WAVE that have other high frequency content riding upon the carrier wave; as does our VIOLET RAY energy. It is not intended to be thought of as audio pulses alone. Yes, you can pulse audio at 7.83 cps as an ELF or extremely low frequency that is below the human hearing range. And yes, it is EM energy. But, it will be missing the full wave, higher frequency content that makes it something else altogether. So the VRCR energy is “something else” altogether. The Schumann Resonant carrier frequencies prepare and open the Chakras to the higher and more complex frequency waves content which interact with our biology on all levels; including those of Quantum Biology. Traditional or standard fare PEMFT equipment does not even come close to this level of interactivity with biology. That’s because they stop short by providing ONLY a carrier pulse with no higher content. Its based on the task at hand and which chakra quality you wish to focus upon. The art of Feng Shui deals with arranging the natural energies of our Earth Environment. With careful attention to the flow and arrangement of objects, forces and conditions that create and affect such energies, Feng Shui Masters can improve our living environment conditions for better health, abundance, peace, creativity, and so on. But what they don’t address to a large degree are the artificial sources of energies that are not in natural harmonics of the Earth. The Earth has resonant core and ionospheric frequency pulse rates. As humans, we live immersed in the electromagnetic fields and energies of our planet. Those positive energies that our bodies are a part of and adapted to can easily be overcome by man made, electromagnetic pollution sources that are not in harmony or resonance with the Earth. The VRCR is an energetic, Feng Shui Healing device that neutralizes harmful sources of energy. The overview on how the VRCR neutralizes harmful EM pollution signals is simple. Its a matter of energetic and informational resonance. Your body will resonate with the strongest and closest frequencies to itself. The VRCR overpowers the background EM pollution in the environment. It gives your body healthful, Schumann Resonance frequency and energy which you can resonate to in place of harmful frequencies. Wherever humans dwell and work in this modern age, they are bombarded with a vast array of electromagnetic frequencies from artificial sources. AC power in our homes, power lines along the roads we drive, cell phones and cellular towers, WiFi and routers, computer monitors we sit in front of for hours at our jobs, and now more than ever, in our homes too. Don’t forget microwave ovens, microwave towers, unknown experimental or governmental sources, walkie-talkies, all radio, television and other communication frequencies; radar beams, etc. Speaking of cellular phones, how much closer can these electromagnetic pollution sources get to our brain? Now, with virtual reality headsets, we can play 3D video games for hours with our favorite phone mounted right in front of our eyes and brain. Can’t get any closer than that. Virtually ALL of these devices are DANGEROUSLY INCOMPATIBLE with our sensitive Power Centers (chakras), which regulate the energy transfers from the “outside” to our nervous system. Being exposed to high amplitudes of frequencies and quantum information fields in disharmony with your finely tuned Chakra centers eventually takes its toll; causing our chakra system to get out-of-tune and unbalanced. When our energy flow is distorted and/or suppressed, the result is what we see in our society today: i.e. More disharmony, discord and rampant disease including autism, auto-immune issue, kidney failure and overwhelmed and failing biological systems everywhere. the instant the VRCR is switched on, your body starts to resonate with “Earth Friendly” frequencies that neutralize EM pollution signals. Once you get used to being in a pollution-free environment created by the VRCR, you will not want to leave it. It feels refreshing and you will feel increased alertness. We have the scientific capability of demonstrating all of the above by connecting a person to a sensitive EM field strength or frequency meter, take a reading and then observe the change as we switch on the VRCR. The VRCR instrument does not even have to be in the same room. The reading immediately jumps to the frequency emitted by our “Earth Friendly” VRCR! Note: Please do not assume that the minute you turn on your VRCR, all your Chakras will immediately jump into alignment and stay there. Normally, it takes consistent use and repeated balancing of your Chakras or biofields in order to entrain them back into healthy resonance and remain there. After all, man made electromagnetic stresses are not going away any time soon and it is most likely to take some time to develop the ability to deal with that stress at the biological level. Nature however, is miraculous and does find ways to adapt to outer environmental stress so long as we do not add to that stress with our belief systems that have major influences on our biology as well. At a belief systems worst moment, a hypochondriac can literally create illness in an instant. At its best, a positively entrained belief system can create healing in an instant. Which would you choose? Nevertheless, you will feel the soothing influence of the VRCR immediately. Run the VRCR 24/7 and enjoy your newly created and refreshed environment. Your VRCR has the capability of amplifying and radiating (transmitting) your thought or intent energy. When you work with the VRCR, we recommend you be very clear in your mind as to what you wish to accomplish. This device may be used in various capacities such as sending energy to someone with their permission or if not, stipulating that said transmission is sent according to DIVINE ORDER. With the VRCR switched on, take the Bronze Programming Wand and “write” your message on top of the Injector Crystal, one word at a time, without lifting your wand while writing a word. We were told that such programming is permanent in contrast to methods 2, 3 and 4. Write your full intent on a paper (or print on computer) and place this paper on the Injector Crystal. It does not matter if it is so small you can no longer read it as long as it fits on the Crystal. This programming will stop when the VRCR is switched “OFF”. Touch the Injector Crystal with your hand while holding a clear picture in your mind’s eye of your intent. This programming will stop when the VRCR is switched “OFF”. Directing your thought energy to the Crystal. This programming will continue until you stop sending thought energy. For all of these methods, we recommend that you formulate your intent in a short and precise statement, writing it on a piece of paper using powerful, descriptive words that clearly and adequately describe what you intend to accomplish. Edit it carefully, and then read it aloud to yourself until you are satisfied that it reflects what you desire. Your intentions and decrees will take a cosmic leap onward when you fully understand that what you are waiting for to appear as a manifestation in the outer world is nothing but a reflection of what you are creating in your inner world. What you create in your inner world is based on all those mental, emotional and other multi-dimensional patterns that you play in and choose in each moment. They can be conscious or unconscious choices. Your willingness to make choices that serve you in each moment is based on how much self love and acceptance you give to your own being. This is easier to do when you reach the realization that love comes from spirit and you are that spirit. It comes from you. You simply give yourself that loving, deserving and understanding that until now, you looked for from the outside world. But remember, the outside world is nothing but a reflection of our inner world. So in a process of co-creating reality, you must first give that reality to yourself. It is really understanding that you have that “something” already in you in the form of self loving and deserving. It exists in you. You already have it energetically inside your awareness. What do you have “for-giving” to your self? Are you forgiving yourself for past choices? If not, then come into the present and accept the present of presence. In this way, the reality you are looking to see fulfilled already exists in you as a pre-sent reality. So co-creating is not so much about receiving (that implies something outside) but about giving. (Giving implies something that comes from you, yourself, spirit.) It is also helpful to realize that the truth of our oneness with all the universe really does mean that we are the universe. In that regard, If you are to receive something, where else will it come from but you? Feel that for a while! Now back to our regularly scheduled channel…..
We recommend setting the VRCR to the CROWN CHAKRA or UNDERSTANDING CHAKRA frequency unless you are sending healing energies to a certain area of someone’s body; in which case you set the VRCR to the frequency of the power center controlling the area being worked on. Feel free to experiment and follow your intuition! The VRCR is an excellent tool for enhancement of your personal Meditation Technique. The VRCR could be set to the SOUL CHAKRA or ANY high setting taking you where you wish to go. For best results, find a way to place the Crystal Wand (or in this category of use,) the Pyramid Antenna six inches above your Crown Chakra. (Hang the Antenna over your head from the ceiling or if laying down use a pillow lengthwise, then place Wand on pillow above head.) State your intent to relax and meditate. Then follow your usual routine. 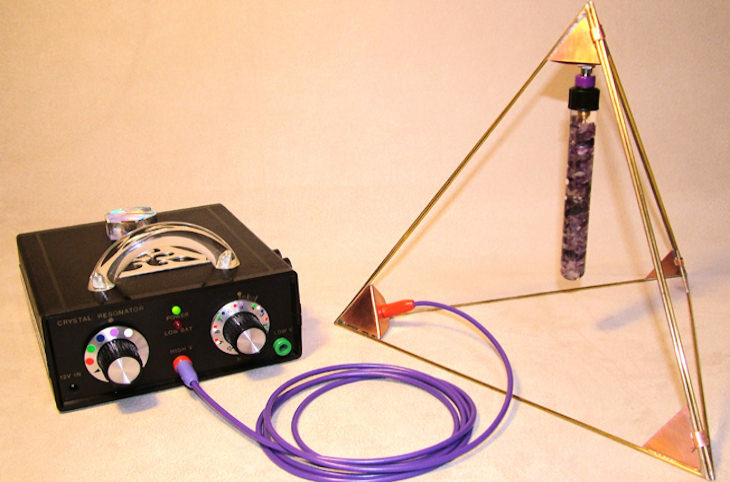 The Pyramid Antenna would have more powerful radiation of the VRCR energies than the Crystal Wand, so it is NOT necessary to be within 6″ of the Antenna. Being in the same room will suffice but the closer the better. Try it. These high settings are better for what we term an “Active” meditation that has a goal or purpose. Doing this type of meditation will have better results after having done a full 16 Chakra balancing and tuning when you find your whole being in an optimum state of receptivity. The active purpose could be to become “one with god” or access information from spiritual guides or healing from your high self or over-soul. In fact, Saint Germaine originally informed Jack that one of the intents of the Violet Ray energy developed by the VRCR was to assist humanity in performing the “I AM – Violet Flame” meditation. The Violet Flame meditation is an “active” meditation where you use your imagination and visualization to tune each of your Chakra Centers. Then, when all are fully tuned, make contact with guides, etc., for the personal healing you need. Setting the VRCR to the Brainwave Frequencies and placing the Wand or Antenna near the “Zeal” Chakra behind the Hypothalamus will greatly assist meditation of a more passive nature. In “Passive” meditation, there really is no goal other than quieting the mind and reaching deep states of peacefulness and bliss. Of course, just as with active meditation, this may lead you to deep communion with spirit where you may receive information and healing. Passive meditation is more akin to what Buddhists and Zen practitioners focus on. It places more awareness on “Being” rather than “doing.” It creates a focus on the “Now” moment and reduces expectation. In either a passive or active meditation, using the VRCR greatly assists you to reduce “monkey mind,” strengthen intent and focus or block out outside energetic disturbances through the “Posikiation” process. If you can, place the antenna in the middle of the room but anywhere in the room will due. Choose your frequency and let the VRCR enhance and amplify meditation technique and group intent while supporting a calm and centered atmosphere. A group meditation is a good opportunity to have a common focus and transmit energies for the common good. It is our opinion that no gathering of like-minded people should terminate without the participants transmitting energies for the purpose of assisting mankind in some way. The tremendous synergy (the total energy being transmitted far exceeds the sum of each individual’s energy) that is created in such a gathering is amazing to fathom. And, it can be amplified even more with the Radionic properties of the VRCR. Don’t forget, the VRCR energies being transmitted by the antenna will also be radiating out and connecting with the Crystal Light Grid. So take advantage of this opportunity to send Love, Peace, etc., to whatever destinations are chosen. The Crystal Food Charging Plate is plugged into the High Volts Output socket in this configuration. When using VRCR in this mode, simply place prepared drink or food onto the plate and turn the VRCR on to the Heart Chakra Frequency for a minimum of 30 seconds. The plate has a coil winding embedded in the ceramic that radiates the Violet Ray, Tesla Energy throughout. And a special Crystal Dust coating placed on the bottom side effectively makes the plate act like a solid crystal. Thus, the Crystal Food Plate uses the same Posikiation Process as talked about earlier, to remove negative energy from food, drink, or whatever is placed onto it, and to recharge it with positive energy. So don’t discount the VRCR’s structuring ability on water and food. 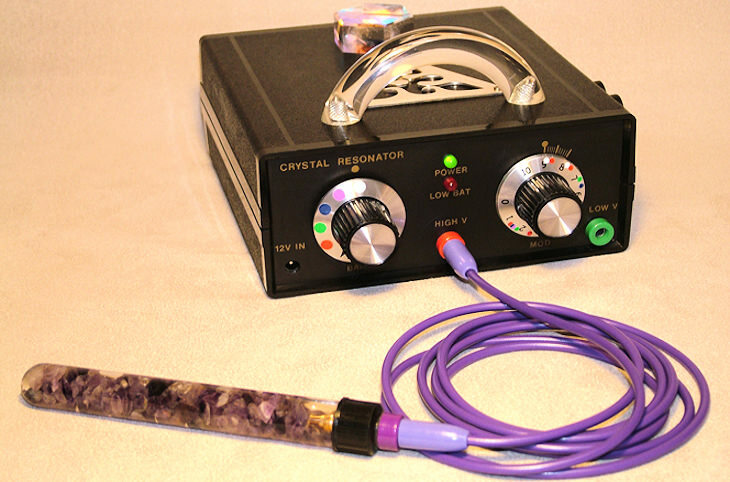 Setting the VRCR and Crystal Food Energizer Plate to the Heart Center Frequency provides the strongest AMT Coil energy with the most powerful manifestation of the Violet Ray energy. Just 30 seconds of energizing and your drink is revitalized and likely tastier as well. Try it with Wine! Soften flavors and release aromas of your favorite Cabernet Sauvignon. The same goes for food prep. Enrich the flavors of your next Paneer Butter Masala dish. Plants even like it! Bring wilting, cut flowers back to life and watch them perk upright practically right before your eyes. We suggest using more subtle settings than the Heart Center for live, uncut plants, as it can overcharge them when not being accustomed to such highly concentrated life force energy. Program your food and drink to serve the healing of any part of your physical body or being – Simply place your hand atop the Injector Crystal of the VRCR and encode your intent into the machine to transmit it to your food through the Crystal Food Plate. If you want to do more advanced memory and energy structuring of water in larger amounts, you should take a look at our Twin Vortex Living Water Technology, the WoLF or Water of Life Fountain. Be careful about touching the food plate, particularly around the edges as it is being charged with roughly 90,000 dc volts of energy. Not harmful but shocking! To give you a clue about how shocking it is: The average static electricity charge that you might receive from walking across certain carpet materials and touching a metal door knob or sliding out of a chair and touching metal is about 30,000 volts. See health warnings for VRCR and its attachments. By placing the Crystal Wand that is energetically charged to various frequencies at the base of the brain and behind the head’s Zeal Chakra, we can properly tune the Medulla Oblongata. This enhances its natural process that influence the rest of the brain, mental and physical health. For the following list of settings, place the Wand on the Zeal Chakra for a minimum of 3 minutes at each setting you desire. We recommend a complete Chakra Balancing and Tuning before using these Brain Settings and Tuning. the High Volts Wand will be placed at the base of the brain called the Zeal Chakra. Under some circumstances, the Pyramid Antenna may be used instead of the wand. For optimum effect, find a way to place the Wand to the “Zeal Chakra” at the base of the brain (rest it on a pillow, top of a chair back or make yourself a necklace that will hold the Wand at your back. Be innovative. Using Pyramid Antenna in place of Wand in close proximity also works. Just having the Pyramid in the room works but having it closer is better. After a minute or two, change the VRCR setting to the ELIMINATION CHAKRA – RED – 15.66 Hz – promotes Beta State for one minute. When done, switch back to ELIMINATION CHAKRA – RED, for one minute. Set the VRCR to EARTH CHAKRA – RED – 3.92Hz – promoting “Theta State” for creative dreaming. If still not asleep in ten minutes or less, set the VRCR to RED, 0 (zero) – aprox. 2Hz – promoting “Delta State” for deep sleep. Good Night.